There are still some hours left in the second day of NaNoWriMo, but I wanted to post an update. I'll be working the rest of the day, so what I've done so far may be it: I hope not, but it's possible. This morning I had to move to our downstairs bedroom for an additional two hours of sleep, because the contractors were at the house by 8:30 am to work on the bathroom off our bedroom, and I didn't get home from work until a little before 2 am. So I took myself and a blanket and my clothes downstairs to the guest room; which is now a storage space for both the washer and dryer, miscellaneous things from the downstairs bathroom cabinets (on which the work has been delayed - but that's okay - we'll have a full bathroom, complete with shower and tub tonight!). I had to move a few things off the bed, which I did, in spite of being so tired I was dragging, and I lay down on the bed and slept for almost another two hours. Then chiropractic appointment. Then a stop at a nearby cafe for a breakfast bite and a decaf soy latte ... and ... to do some NaNoWriting. And I did. About 1100 words in 45 minutes. This leaves me another 567 to reach the day's average. I'm hoping to be able to get that out on my dinner break tonight; we'll see! I also wanted to post the calendar I made for my laptop wallpaper. Every year I make a calendar which inspires me and is somehow related to my story (or the story as I know it when I make the calendar!). A few years ago another Wrimo made a calendar template to cut and paste to make your own. It has the date and the target total word count. It's helpful to keeping on track. 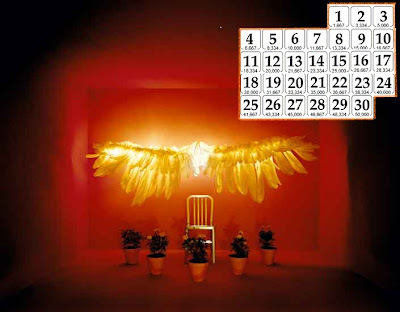 I searched the internet for an image for my calendar with the keyword "bardo" (my NaNo working title is "Forty Nine Days of Bardo") and found some really nice ones. But this one really spoke to me. Several images from this particular body of work were candidates, but this one won. The body of work is called "The Birth of Bardo" by Adia Millett. The picture below shows four of the pieces, and you'll see my calendar and which of the four I chose below that. I am looking for more information on this artist's work. I like it and want to learn more about her. I chose the red, top right one, which is "The Birth of Bardo 2." Here is the calendar I made, complete with my word count targets for each day in order to reach 50,000 by November 30th. I've also put this calendar on my Blackberry, so it is always with me and always visible. It is inspiring and speaks to the essence of my plot. Which is good. The essence is about all I have; still.